Who doesn’t love getting traffic on their website? Everyone does. But sometimes, in order to get ranked in a search engine or get more traffic, one needs to look out for their competitor. There is nothing wrong to spy a little on another website, its just mean you want to improve your website. That is why we have put together 7 Best Website Traffic Estimator Spy on your Competitor Traffic. When we talk about web traffic, we need to be more clear about it. from where we are getting hits on our page? What exactly our reader is searching? What are the keywords? Is the content is useful to them? All those questions are important and that is why we need to be keen to know about our competitor traffic so we could find how they are doing. You would know the exact keyword they are targeting in your niche and you would find how are the response they are getting. The form that you could determine what changes you need to do on your website. You can know how much vies and hits they are getting on their website. You will have a total report on their website and then you can compare your number to know where do you need to change. You would know where they are getting traffic, such as social media site or paid traffic. That’s how you would know where you need to focus on. So that you can also use those resources to get more traffic. From all the data, you would know what exactly your niche reader love to read, what helps them and how you can change your content accordingly so that you will get the same traffic. There is a countless reason on how much it would help you but in the end, you need a tool to estimate competitors traffic. Here is the list of 7 tools which let you “spy” on your competitor’s traffic. Imagine a tool in which you just have to type in your competitors URL and you will get every information you ever wanted. That is the power of SimilarWeb. It does not only reveal the traffic number but also comprehensive detail too. This tool will let you know the number of page views, bounce rate, referral and social backlinks. This is a simple and free tool, for which you just have to sign up. You can take advantage of it and create an edge over your competitor’s traffic and gain more view down the road. More than that, they will suggest you who you need to watch out for, competitor suggestion tool will give you more idea and you can check out their rank and views. You can visit SimilarWeb to know more about it. One of the most recommended tools for any type of research on a keyword to traffic, this tool has everything. They have been on the internet for a long time and create a tool which can almost accurately measure traffic. 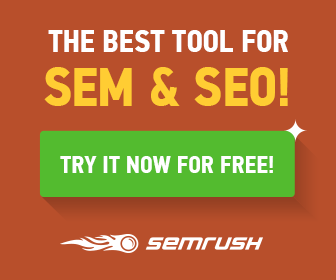 SEMrush can provide all types of data like organic search, backlinks, keywords, and analytics too. You will find the ad keywords and traffic right on the page with the pictorial presentation. This tool can let you search 10 times one you sign up, then you have to upgrade it to pro version. Visit the SEMrush to know more about it. it would be the ultimate tool which let you find out on which keyword they are ranking and on which keyword you need to focus. What is better than Google itself? No one. We all agree that google the BIG boss of the internet know everything and have 100% accurate data. That is why using Google Adwords will help you find the detail about your competitor’s website. Once you enter the URL of your competitor you will find unique visitors, average number of page views per visitor, average time on site, total page views, total unique visitors to a website in a month’s time, and much more. You need to check out Google AdWords Display Planner to learn about it more. This tool is rapidly gaining its foothold in the market and every one, even the newbie to pro are using their services. It has one of the biggest database 45 million keywords, generated around the world. It can be used as link checker on your competitor’s website. You can check the link gained and lost in almost 30 minutes of refreshing index time. You can look into the organic traffic too, but it’s a paid tool. However, you can get 7day trail for 7$ if you sign up. In the pro version, you can get Labs/Tools, SERPs Analysis, Site Explorer and Report. You can check out Ahrefs website to know more about it. We all know how important it is to get a backlink. But you also need to find out from where your competitors are getting backlinks too. One of the best features about this tool would, its free. You can get detail page of the link and anchor text along with states on how many backlinks they get. You can look up to them and find out how can get one too. You can also check which links are been removed, so you can pursue them to give you a backlink. Check out the Ranksignals single website and learn much more about this totally free tool. This tool is just to spy on your competitors and it has its own perks to show for. You can search for the keyword in an organic keyword and paid keyword so you could have a total overview of which keyword is used by your competitor’s site. You can get ad history in it, for that you need to sing up. You will get information on how are their ad campaign is doing and you can actually see how good they did at conversation rate. This tool is easy to use and free. Just check out the Spyfu website and get started. No one can deny the fact that social media is biggest traffic generator if used wisely. That means you also need to have an upper hand to your competitor’s social media activity. This tool can help you do that easily. It has more than 35 social networking integration, you just need to follow your competitors streamline to know more about it. what are they tweeting, what are they sharing, what hashtags they are using? You can monitor all of them from one place. After that, you can work on your own social media technic and target the same niche to get more traffic. Visit the HootSuite website to know more about it. These are the 7 best tool which can help you to estimate and follow the traffic of your competitor. If you have used any of them and know any more of them, just comment down to let us know.